The legendary Dave Pensado of Pensado’s Place and Recording Connection mentor Matt Linesch recently got together at Ocean Way Recording to shoot a very special episode of Into the Lair, called ITL for short. It was a fun, informative gathering with lots of fellow audio heads on hand to help including Recording Connection apprentice Hannah Finegold, who also appears in the ITL segment. In just a few short years, Matt Linesch, known as “Linny” has made a name for himself as the engineer and mixer behind projects like the self-titled 2013 release Edward Sharpe and the Magnetic Zeros and their 2012 album “Here.” He’s also worked with Dave Mason, Insects vs. Robots, Fool’s Gold, The Cerny Brothers and the Australian band Wagons. 2013 included a foray into the realm of movie soundtracks as engineer on Golden Globe winner “All is Lost” starring Robert Redford. Over the years a multitude of music’s greats have recorded at the Ocean Way including: Frank Sinatra, The Rolling Stones, The Beach Boys, Nat King Cole, Eric Clapton, Michael Jackson up to today’s greats: Radiohead, Kanye West, Mars Volta, R.E.M. Dr. Dre, The Red Hot Chili Peppers and many more. 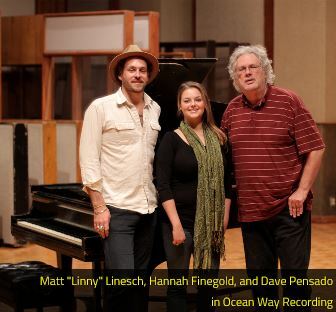 Ocean Way Recording is also where Matt Linesch has setup shop, relocating from Ojai back to the LA area. And now a few Recording Connection students will have the opportunity to learn the craft or audio engineering and music production straight from one of the industry’s rising stars. Be on the lookout for the forthcoming Into the Lair hosted by Dave Pensado and featuring Matt Linesch and apprentice Hannah Finegold.